It's officially less than a hundred days til Christmas and the pressure is slowly building for makers. I always start off with grandiose ideas of amazingly complex projects. Then reality sets in and I realize 'Nobody got time for that!' I give myself a quick face slap and scramble for my needles and yarn. My list of handmade gifts is usually small. First on the list is my husband. My husband is, and forever will be, knitworthy. He wears everything that I've made for him (and for myself). Although his sock pile is a little slim, there's no real pressure to get things done by Christmas for him though. I'll knit for him all year long. Second on the list is my dad. He still wears the camouflage print knit scarf made out of scratchy acrylic I made for him years ago, so I know he appreciates my work. Last Christmas I gifted him a pair of socks and he actually wore them! Since he's proven sock-worthy, I will now attempt to knit him two pairs. 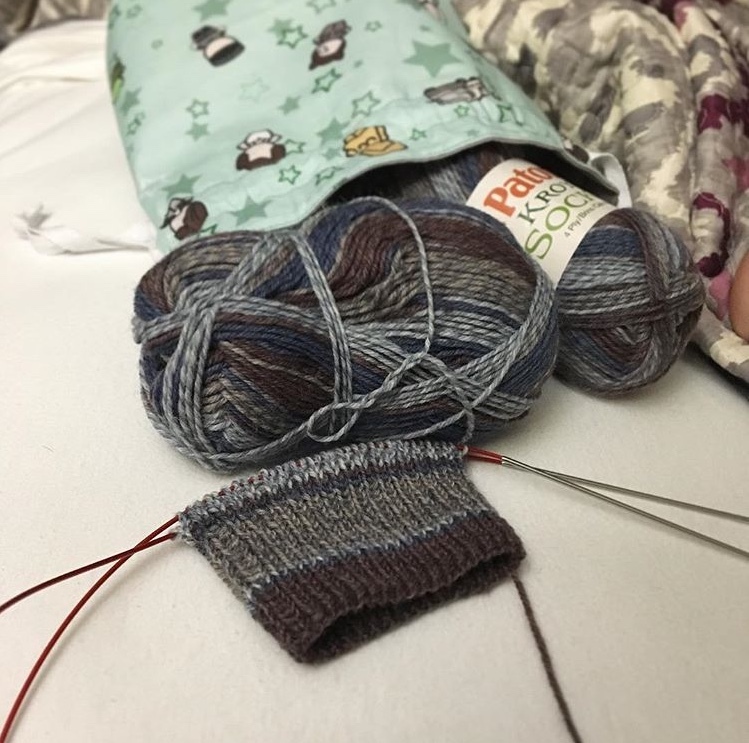 I casted on using Patons Kroy Socks in Blue Brown Marl, which is a self-striping yarn of blues, grays, and browns. Project details can be found on my Ravelry page here. Hopefully I can get these finished by the end of October and cast on for the second pair. Third on the list (and really, she just squeaked in there) is my mom. I'd like to say she's always knitworthy, but the truth is she's really very picky and usually prefers store bought. That's ok. I don't take it personal. She doesn't wear anything I've made for her in the past but she is curious about socks. I agreed to make her only one pair. Scratchy hard-wearing wool is out of the question for her since she is very sensitive, so I decided I'd dip into my Knit Picks Capretta stash. I have a few balls in Platinum left that I think will be soft enough for her feet.